Automatic columns definition based on the underlying data source. Manual columns definition in XAML or code-behind. This help article explains how to do both with code examples. By default, RadGridView will generate its columns automatically based on the underlying data source. When, for example, you set the ItemsSource of RadGridView to a collection of employees (see code in Example 1 and the result in Figure 1), the control will create a separate column for each public property of the Employee object. However, if you wish to explicitly specify the column name for certain property of your data class or to prevent the creation of a column for it, use the System.ComponentModel.DataAnnotations.DisplayAttribute, as it is shown in the sample below. Example 1: RadGridView generates columns automatically. Figure 1: The result of letting RadGridView automatically generate two columns. You must add the columns to the Columns collection of RadGridView. Later on in the application lifecycle, you can easily access them via the UniqueName property of GridViewColumn, or by the index of the column. To see this sequence unfold, look at the following step-by-step example. Define a column of type GridViewDataColumn. You will find the column types in the same namespace (Telerik.Windows.Controls) and assembly (Telerik.Windows.Controls.GridView.dll) as RadGridView. Set Header property and add the column to the Columns collection. The default Header will be the property specified as DataMemberBinding. You can utilize the UniqueName property of a column only when you have also configured the DataMemberBinding for it. Otherwise, please define GridViewColumn and use its Header property instead of the UniqueName one. 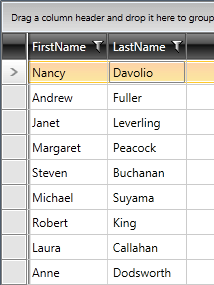 To access the column later, use the UniqueName value or its column index as a key for the Columns collection. RadGridView provides a mechanism for easily fetching the properties of one column to another. This can be done through the CopyPropertiesFrom method of GridViewColumn.